Conducting research on innovative methodologies and approaches to improve and enable health-informed decision making. Building capacity of communities and stakeholders to engage in and inform healthy decision making. Implementing evidence-based strategies that promote sustainable approaches to health-informed decision making. We mainly approach health-informed decision making through the tool of health impact assessment (HIA). HIA is a method and a process to ensure that public policies, projects, plans, and programs contribute to the health of the population and health equity. 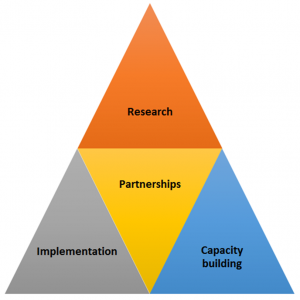 We carry out research on HIA methodologies (HIA, Equity focussed HIA, Human Rights HIA) and approaches. We support people and organisations within and beyond the health sector to develop the skills and experience to undertake and commission HIAs and Equity focussed HIAs. We are the largest and most established HIA team in the Australasia. Initially funded by NSW Health as a capacity building program the HIA team has now supported over 50 HIAs in across, trained over 600 people across Australia and internationally in HIA, established an annual MPH course and professional development courses at UNSW. In 2010 CHETRE was awarded the International Association Impact Assessment (IAIA) organisational award for outstanding commitment to HIA Capacity Building.